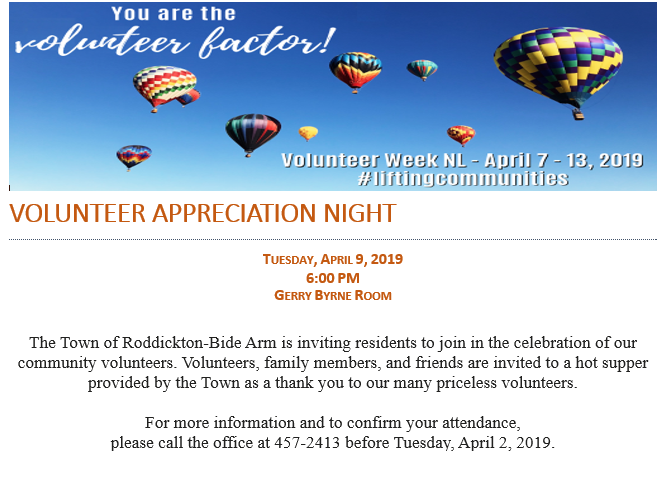 On behalf of the Town of Roddickton-Bide Arm we would like to wish everyone a Happy Volunteer Week. We express a sincere thank you to all those volunteers who give to our community in so many ways. This evening we will celebrate with some of those volunteers. For those who have responded, the supper starts at 6:00 pm at the Gerry Byrne Room. Thank You as well to the Community Sector Council NL on awarding the Town a $100 volunteer grant. For more information on this event you can contact greatnorthernvikingfestival@wendynuttall.ca. will impact their distribution. Currently, information on mosquitoes in this province is not well known. This two-year project, ending in Spring 2020, is funded by the Public Health Agency of Canada (PHAC) and will address the knowledge gaps in the mosquito populations o Newwfoundland and Labrador. To adequately cover the entire province and increase their sample size, members of the public largely do mosquito collection. 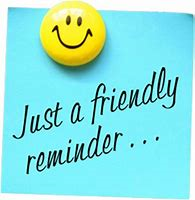 The materials and instructions necessary for mosquito collection will be provided, and the collection process is fun and easy for most ages to participate. Any mosquitoes received from the municipality will be identified within a short period, and the results returned to the collectors with information about the species they collected. The team will provide support where needed. Mosquito collection would start in the spring of 2019 and go until the fall of 2019 to which collectors can collect as many or few times as wanted. This request for quotes for the redesign and development services for a new website for the Town of Roddickton-Bide Arm. 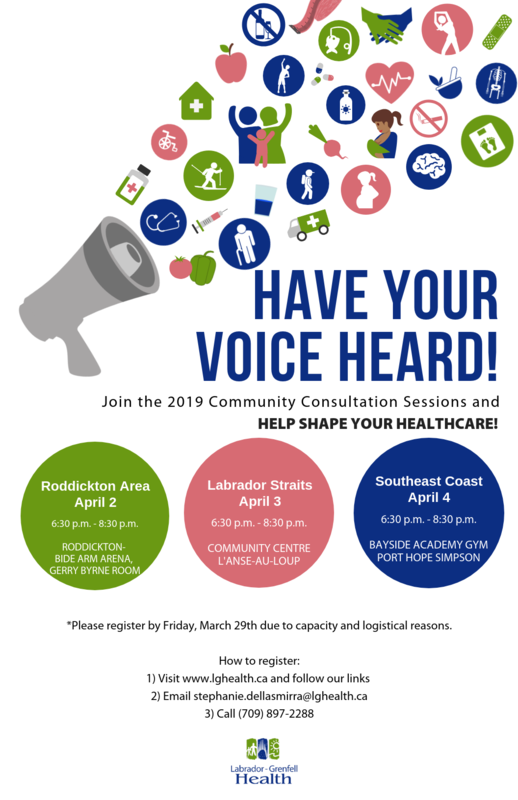 The Town of Roddickton – Bide Arm is currently seeking quotes for the development of a new website that can be viewed on any platform and allows the Town to better meet the needs of residents, businesses and visitors. Our website has three target audiences: Residents, Businesses and Visitors. The website will reach these audiences while complimenting the Town logo, it will also utilize recognizable Town icons such as Moose, Green Moose Interpretation Centre, Ashton House, Forestry, Fishing and the community. Our website’s number one objective is to allow visitors to find the information that they are looking for easily and quickly. Our new site must be clearly Roddickton – Bide Arm, be clean, and be easily searched by the user. In terms of content, special effort must be made so that Town regulations are made easy to load/update and easy to find/access. The second major objective is to allow town staff access to all pages on the site and be able to add news content in an easy-to-update manner. •	An easy-to-use content management system encompassing all aspects of the website, including a training session for town staff. The Town requires administrative access to the full website and the ability to update content, including documents and images, quickly and easily. Thank you for your interest in responding to this quote with a proposal for our new website. We look forward to your response. The Town of Roddickton – Bide Arm will not be liable for any costs of prepared or presentation of quotes. Any submitted quotes and accompanying documentation become the property of the Town of Roddickton – Bide Arm and will not be returned. Please note that the Town of Roddickton – Bide Arm does not bind itself to accept the lowest or any offer. The Town of Roddickton – Bide Arm reserves the right to negotiate with the selected respondent changes in their proposal prior to, and/or as part of awarding the quote.